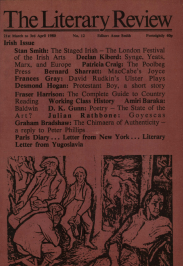 Joyce’s later fiction is now, alas, widely tolerated in English Departments and the general reader of an uncut Ulysses is unlikely to be prosecuted, even, now, yet. Colin MacCabe’s long-advertised book should change all that. It won’t, of course, since the toleration rests on well-tried liberal techniques: marginalisation and common-sense discrimination. By now, Joyce merely excuses restricted enclaves (‘I’m working on the comma in Finnegan’s Wake.’ ‘Oh, which one?’), occasions instant editing (‘I get lost round about Wandering Rocks, and the whole thing tails off at Oxen.’) or cures common-room nostalgia (‘Clive Hart once told me that my edition of Wake has 11 misprints- I’ve been trying to find them ever since.’). But where has all the indignation gone?